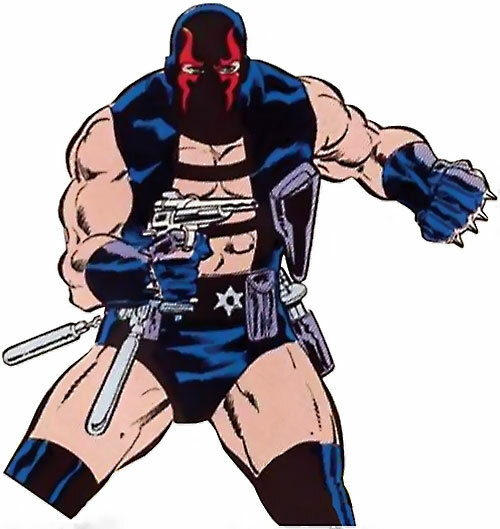 The KGBeast is a well-remembered DC Comics villain. He appeared in a late Cold War propaganda story, the Batman epic Ten Nights of the Beast, in 1988. In this story he’s a quasi-invincible KGB assassin, a match for the Batman himself. The KGBeast did return after this notable story. But he was considerably diminished, with a different appearance and character sheet . Thus, these appearances are treated in our second KGBeast character profile. Other Aliases: The Beast (his KGB codename – “KGBeast” is the name used by the CIA). Height: 6’3” Weight: 231 lbs. The KGBeast is a huge, extremely powerful and muscular man. Furthermore, he sports discreet cybernetic enhancements within his body. He is a formidably well-trained and experienced assassin, special agent, and martial artist, and he has trained with every weapon under the sun. He can easily kill a man in a single blow, and seems to be a match for Batman. The KGBeast is as fast and as agile as a cat. He is every bit as good as the Batman in rooftop acrobatics and mobility. Due to his size, muscle and cybernetic reinforcements, the Beast is markedly stronger than even Batman. Knyazev could punch through walls and perform other feats of strength his opponent had no hope to match. He also seemed slightly more durable, though not significantly so in game terms. After his hand gets cut off, Knyazev wears an attachment to his stump, containing several weapon systems. At several key points of the story, the otherwise infallible KGBeast takes inexplicable, absurd decisions. Examples include hacking off his hand instead of the rope, or not shooting the second President Reagan decoy. These sudden bursts of idiocy are what allowed the good guys to win. In DC Heroes terms this is treated like the Uncertainty Drawback (though the Beast will take an absurd snap action rather than fail to act). In DC Adventures terms this is a Complication. Anatoli Knyazev, code-named the Beast, was the top assassin of the KGB. He conducted numerous terminations, often in difficult circumstances. Not all of those were State-sanctioned. Knyazev was working for a special bureau inside the KGB, known as the Hammer. The Hammer, headed by chief deputy Zhores Kunrev, had its own agenda. For instance, Knyazev was rumoured to be the man who ran the assassination of Anwar Sadat . 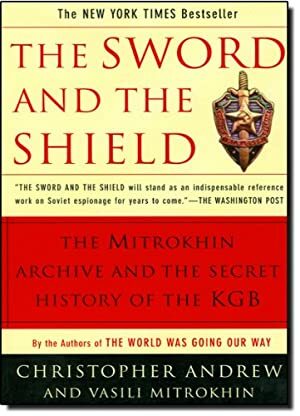 When the perestroika movement rolled in, the Hammer posed an obvious threat to Michael Gorbachev, who had a special unit sent to capture Kunrev. All were expecting fierce armed resistance, but what they uncovered was worse. Kunrev had committed suicide and activated Project : Skywalker. This meant that the Beast had been clandestinely sent to the US with a list of ten key men in the Strategic Defence Initiative, with orders to terminate with extreme prejudice. Gorbachev sent an intelligence officer to brief American agencies, as well as the police of the town where the hits were expected to take place : Gotham City. By that time, however, the KGBeast had already set foot on US soil. The smuggling boat he was in was greeted by eight DEA agents, who had mistakenly identified as a drugs-running one. Knyazev killed them all within seconds with his bare hands, and proceeded with his mission. By the time the briefing was over, two of his targets had already been terminated. Batman reached the third only to find a corpse. 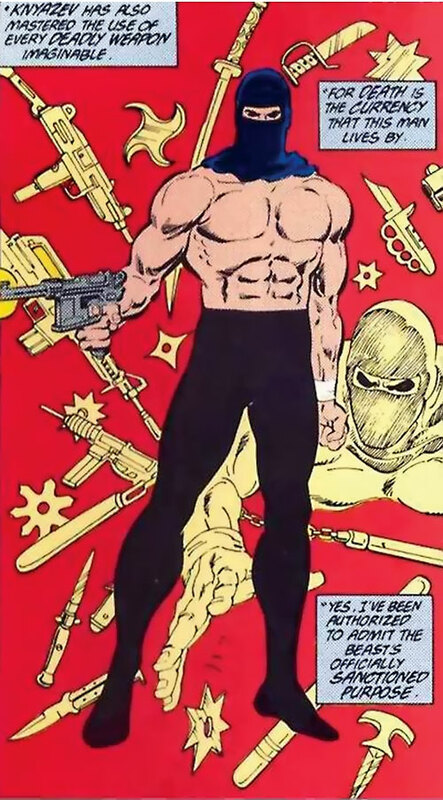 A few hours later, KGBeast’s helper, an Iranian agent, killed the fourth man. It then became clear that there was a mole passing information to the Soviet super-assassin. Personal protection was provided to five of the remaining six likely targets. The last one, a mathematician, couldn’t be located until the following morning. When the police arrived, she and her boyfriend had been killed hours before by the KGBeast, who had replaced a bottle of orange juice with one containing a gaseous neurotoxin. The next target, a major Republican Party man, was killed during a fundraiser despite impressive security. The KGBEast had arranged for his accomplice to be mistaken for a chef sent from Washington by the State Department. They poisoned the entire banquet to get their man, killing 80. Batman tried to intercept the impostor, but the Beast intervened and they drove away. Batman landed on their getaway van, but the Beast drove it straight toward a school bus, forcing Batman to let them go so he could grab the wheel and prevent a catastrophe. Batman outmanoeuvred KGBeast on his next target, replacing his targets with dummies before the Soviet shot up the room with a bazooka. The two men fought, but the American was surprised by the sheer ferocity, power and skill of the Beast, who easily escaped. The Beast’s next target, a general, was to be flown out of Gotham by the next night. The Beast procured a Stinger missile and blew up the private jet shortly after take-off – but the plane had been a decoy. Two of the remaining targets were sent by Commissioner Gordon to a secured hotel. However, the mole immediately informed the Soviet, and KGBeast blew away his first target by planting explosives in his room. The second man was evacuated to the elevator – which the KGBeast jammed before hurling cement blocks down the shaft. The heavy blocks, hurled from 15 stories, demolished the elevator and killed an FBI man, but Batman intervened and wounded the KGBeast. That didn’t save the police squad who intercepted the Beast on the roof. The Soviet slaughtered them all with a nearby fire axe. He then escaped, but the Batman trapped the KGBeast’s left hand in a rope. The assassin had to cut off his own hand to escape. One target remained in Gotham – President Reagan, who was scheduled to visit. 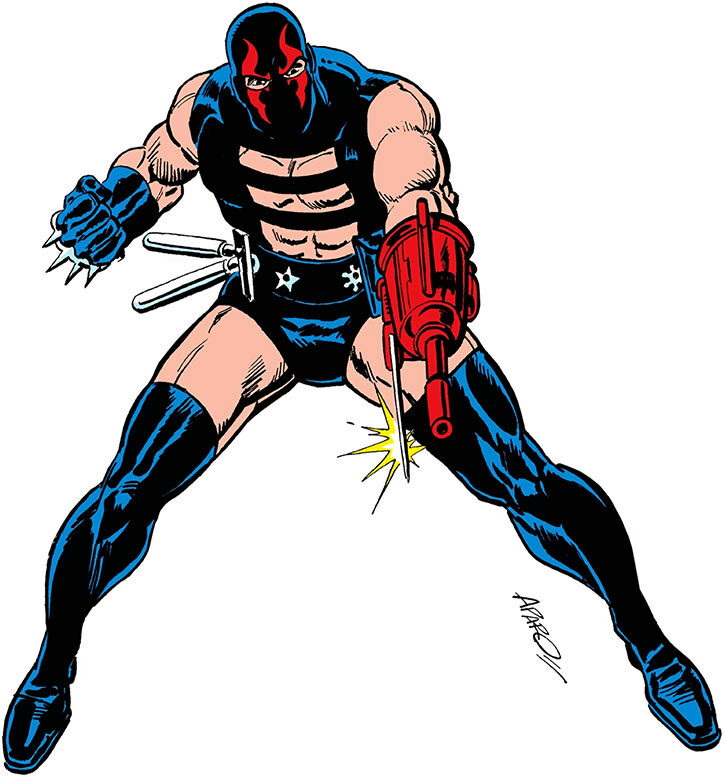 KGBeast had his hand quickly replaced by a weapon so he could return to action and kill the President. However, Batman had determined who the inside source was and fed him false information. Batman then kidnapped President Reagan to prevent a probable assassination attempt at the airport or on the way to the hotel. The Beast’s Iranian accomplice was killed in a suicide attack on a decoy Reagan — actually Gordon in disguise — when Robin knocked his explosives-laden hang glider out of axis. Batman took the second decoy Reagan (actually Alfred in disguise) to the sewers, along with the mole. However, KGBeast attacked from an unexpected direction, leaving half a dozen CIA agents dead. Still, the assassin had inexplicably not focused his fire on “Reagan”. The mole was killed in the battle and the Soviet was forced to flee. Batman and the Beast fought a series of skirmishes and ambushes during the chase, and the KGBeast lost an eye to one of Batman’s darts. Eventually, the Beast found himself in a cul-de-sac. Batman didn’t engage him in combat, instead locking his opponent and barricading the door from the outside to condemn him to death by drowning and/or asphyxiation. At this stage, Batman wasn’t optimistic as to his chances to outfight the Beast on close quarters. He also knewthat Knyazev would be granted diplomatic immunity. Overall, seven key actors of the SDI program were dead, and the KGBeast’s own cold war against Gotham had left roughly 110 dead. Two months later, the KGBeast’s protégé, furious at what he considered a betrayal of his mentor by the new government, became the NKVDemon and launched his own reign of terror in Russia. The NKVDemon was stopped by the Batman just before he would killed Gorbachev. 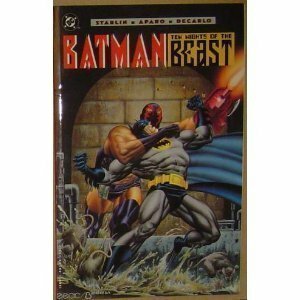 However the KGBeast had actually survived – see the KGBeast (modern) writeup. Knyazev is the Soviet Menace made flesh, the ultimate Spetsnaz bogeyman – a super-Ivan-Drago . He’s a dehumanized, crushing machine-like entity. His sheer efficiency somehow means that it’s laudable to abandon any restraint and all principles in opposing him. KGBeast is cold, taciturn and advances like a bulldozer. His single-minded, fanatical devotion to his mission is barely human. He is a killing machine, unconcerned by collateral damage. But he’s also a superb professional, meticulously preparing each hit and knowing the hit site extremely well, with several escape routes planned. He does not talk much, but when he does alternates between short military sentences, eloquent but short speeches, and stock pseudo-Communist propaganda. As a hitman, his strategy is to hit with maximum force (he prefers to do his sniping with a rocket launcher) and run – not stand and fight. He will avoid any combat in order to vanish so he can carry on with his plan. If chased, he will set up a quick ambush whenever he reaches a point of advantage. He tends to hit from unexpected angles, using unexpected and often unorthodox tactics. He will also wring any last drop of KGB intelligence support he has. This is especially true if they can turn an enemy agent – which they are very good at. The KGBeast is savage and relentless. He attacks with great ferocity and never pauses, never gives up. His tempo in combat is extremely hard to keep up with, even for one as fit as the Batman, and he never loses a fraction of a second. Likewise his strategies are rapid and decisive, not losing a single minute while his enemies try to organise themselves. The KGBeast excels at seizing the initiative, and it is very hard to regain it once he starts rolling. The KGBeast does not fear death, maiming or pain at all. He does not seem to mind dying in the accomplishment of his mission. He’s quite unstoppable, and almost inhuman in that respect. Iron nerves, Language (Russian), Lightning Reflexes, Scholar (Assassination techniques). SPR (Missing one hand, only near the end of this era), SIA toward Completing his assignments, Uncertainty (see below). 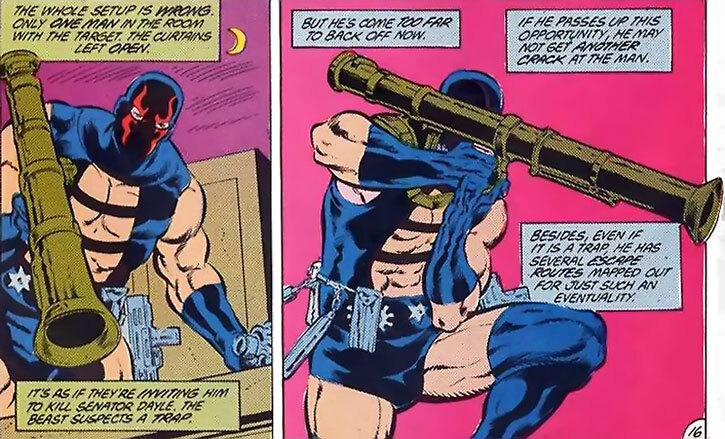 The KGBeast has a Beretta 92 [BODY 04, Projectile weapons: 04, Ammo: 15, R#02] in a shoulder holster. Steel nunchaku [BODY 10, EV 04 (07 w/STR, 10 w/Martial artist)]. Brass knuckles with large spikes (x2) [BODY 10, EV 04 (07 w/STR, 10 w/Martial Artist)]. Trench daggers (x2) [BODY 06, EV 03 (07 w/STR, 10 w/Martial artist), can be thrown]. KGBeast will always procure assault weaponry on site, using his Street Connection and Detective (legwork) skill to locate weapon dealers. Weapons he used in Gotham include a Thompson M1 submachinegun with several drums of ammo, a WWII bazooka and a Stinger MANPAD. He also prefers to grab weapons of opportunity, such as wrenches or fire axes, in order to use his Weaponry skill as AV and boost his EV. After his hand was cut off he acquired the first version of his LEFT HAND WEAPON SYSTEM, which includes a SUBMACHINEGUN [BODY 05, Projectile weapons: 05, Ammo: 08, R#03, Advantage : Autofire], a BAYONET [BODY 07, EV 03 (07 w/STR, 10 w/Martial artist] and a TEAR GAS DISPENSER [BODY 05, Chemical attack: 06, Fog: 05, Ammo: 04, Advantages – Chemical Attack and Fog are always Combined]. Submachine Gun — Ranged Damage 4, Multiattack. Tear Gas Dispenser — Ranged Affliction 7 (Fortitude; Impaired, Disabled), Area (Cloud), Diminished Range 1, Limited (two degrees). Bayonet — Strength-Based Damage 1, Improved Critical 2. Close attack 7, Defensive attack, Defensive Roll 4, Fearless, Improved Aim, Improved Initiative, Power attack, Ranged Attack 7, Takedown, Quick Draw, Uncanny Dodge. Connected, Equipment 4, Languages 1 (Russian). Acrobatics 6 (+12), Athletics 8 (+13), Deception 7 (+9), Expertise (Assassin) 6 (+11), Expertise (Military) 9 (+14), Expertise (Streetwise) 6 (+11), Insight 6 (+10), Intimidation 7 (+9), Investigation 6 (+11) (Limited 2 – Gather Information only), Perception 7 (+11), Persuasion 6 (+8), Sleight of Hand 4 (+10), Stealth 4 (+10), Technology 9 (+14) (Limited 1 – Demolition and Security only), Vehicles 4 (+10). Trench dagger (thrown) — Ranged Strength-Based Damage 1, Improved Critical, Diminished Range ● 12 points. Trench dagger — Strength-Based Damage 1, Improved Critical ● 1 point. Beretta 92 — Ranged Damage 3 ● 1 point. Steel nunchaku — Strength-Based Damage 3 ● 1 point. Spiked knuckles — Strength-Based Damage 1, Improved Critical • 1 point. Shuriken — Ranged Damage 1 ● 1 point. 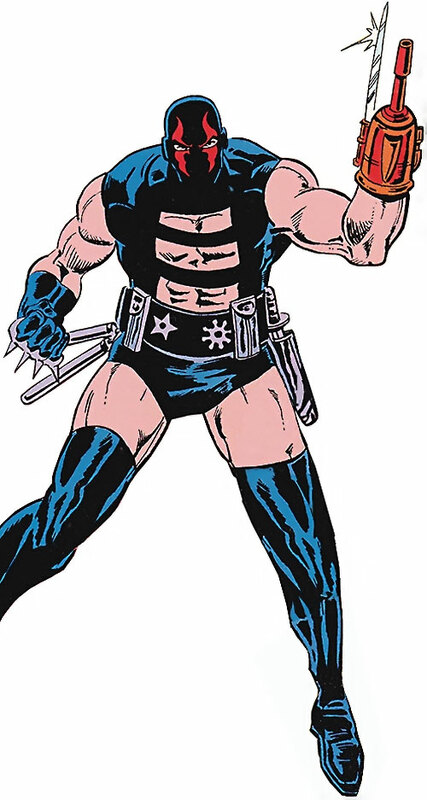 Weapon of choice: KGBeast will always procure assault weaponry on site, using his Streetwise and Investigation skills to locate weapon dealers. Weapons he used in Gotham include a Thompson M1 submachinegun with several drums of ammo, a WWII bazooka and a Stinger MANPAD. After his hand was cut off he acquired the first version of his left-hand weapon system, which functionally replaces the Beretta. Obsession The Beast feels compelled to complete all his missions and demonstrate his superiority over all opponents. Uncertainty Anatoli’s gift for planning and his savage speed belie a fatal weakness; he does not react well to unexpected contingencies. 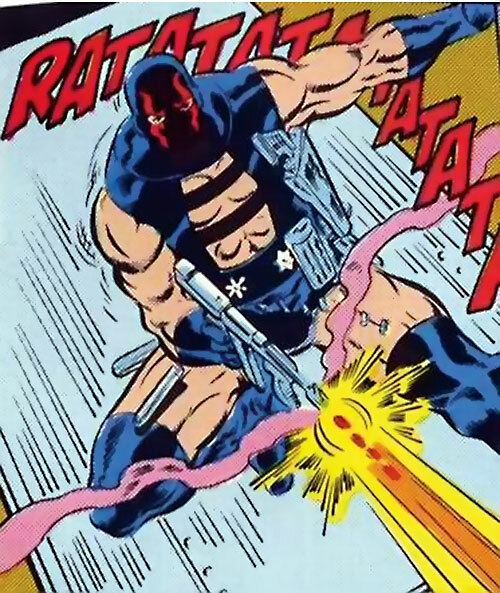 When faced with failure, the KGBeast may take an absurd action (cutting off his hand instead of cutting off the rope), or fail to act (such as not shooting the second Reagan decoy for no discernible reason). Red Right Hand, No Left Hand After his misadventure, KGBeast is missing his left hand. Trade-off areas Attack & Effect PL 12, Dodge/Toughness PL 11, Parry/Toughness PL 11, Fort & Will PL 11. Point total 196. Abilities 82, Defences 24, Skills 45, Powers 12, Devices 0, Advantages 32. Equiv. PL 13. See the notes in OMACS II on writeups.org for explanations about the Batman benchmark. By Sébastien Andrivet (based on v1 and v1.1, both published by Mayfair). DC Adventures stats by Pawsplay. Source of Character: Ten nights of the Beast in Batman (1988).